Brookings economist Ron Haskins puts a hurt on some numbers in this AMs Washington Post. His piece has two parts. The first part, discussed below, has a pretty fat thumb on the scale. The second is about how decisions regarding marriage and the pursuit of higher ed can have a profound effect on a person and family’s economic success. I’ll leave that for now, though I should say that while I don’t often agree with him, Ron’s done solid, thoughtful work on those important issues. Which is one reason why the rest of the piece struck me as uncharacteristically misleading. Let go piece by piece. –We did, and do, argue that the wage and income growth of middle class workers and families has weakened over time–that the middle-class has becoming increasingly squeezed. How does that square with Ron’s findings? He cites research much like that of the Congressional Budget Office on family income trends, noting that middle class income (the middle fifth of the income scale) “grew by nearly 40 percent” 1979-2007 (CBO analysis shows 35%; Ron’s source shows 37%, so about the same–I’m using CBO because it’s available to me in some detail; note that these trends include the effect of taxes, transfer payments, and the value of employer provided health care). First of all, 35% over 28 years is 1.1% per year, over a period when productivity grew at twice that rate (up 72%, or 2% per year). There’s no reason to expect middle-class incomes to grow at the rate of productivity year in and year out, though they did so for a few decades in the post-war years. But this persistent divergence is important context that should not be left out. –The value of health care isn’t as big a deal as he thinks it is, though it’s characteristic of this “myth” literature to invoke the value health benefits as a game-changer for middle-class living standards. This raises two questions. First, are such benefits totally fungible? That is, if the value of my employer or government provided health care benefits is $1,000, is my family that much better off? As economist Gary Burtless reminds me, that’s not how CBO does it–they try to include only the part of employer or governemnt-provided health insurance that represents truly additional income to the family, but it’s very much an art as it is a science. And for the middle class, CBO does count the value as dollar for dollar (and the Burkhauser et al paper that Ron relies on does not make this adjustment, which is probably why they get bigger income gains for the poor compared to CBO). It’s not clear that this is the case, especially given the fact that the rising costs of health care don’t always reflect quality improvements for the broad middle class (i.e., they have more to do with technology and end-of-life care). It’s certainly not worth zero—to go without health coverage is a real blow to living standards. And if you or your family gets sick, it’s extremely valuable. But it’s wrong to just tack it onto income and argue everyone is that much better off. Second, what’s the empirical evidence here? 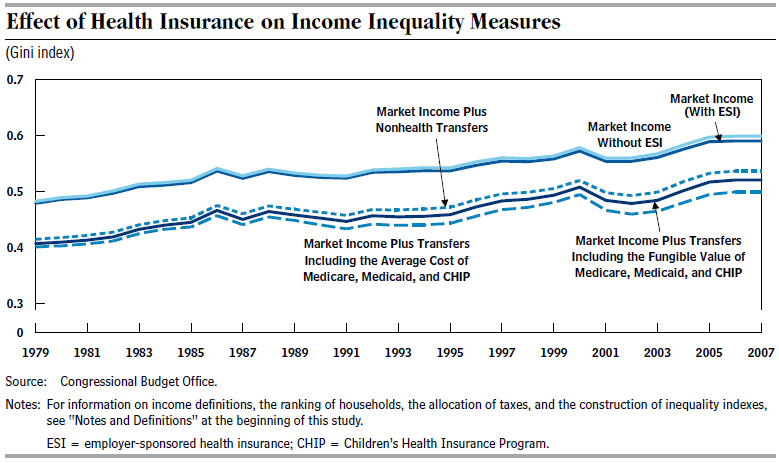 On inequality, as the figure below reveals, there’s little difference in the trend of the Gini coefficient (a measure of income inequality) when you include the value of employer-provided care (see the lines labeled market income with and without ESI—employer-sponsored insurance). The two lines are almost coincident, meaning the increase in inequality doesn’t go away when you include the value of health care. In terms of real growth, it turns out that taxes matter much more than the value of health care. The CBO data show that real median income, all in (taxes, ESI, etc. ), grew 35%, 1979-2007, as noted. Take out taxes and transfers (and it’s taxes that are the big story for the middle, not transfers), and that growth falls by almost half, to 19%, or 0.6% per year. More on that in a moment, but woe betide the middle class–or anyone else–if the fate of their living standards is tied not to economic growth or their labor market outcomes, but to the largess of the Congressional tax writing committees. –It’s also wrong to lump all these time periods together (note: this is a mistake that Ron’s source data—a paper by Rick Burkhauser et al doesn’t make–they break growth periods up in useful ways). About 80% of that 19% growth in pretax income occurred in the 1990s expansion (1993-2000), a period of uniquely full employment, and the only period over the last thirty years when the middle class kept up with overall economic growth. Over the 1980s business cycle, market incomes for the middle class grew 5%; in the 2000s cycle, a measly 3%. –To understand the middle class squeeze, you’ve got to look and wages and hours. Census data reveal the amazing fact that the median earnings of full-time male workers were almost exactly the same in real terms in 1979 as in 2010: in real 2010 dollars, 1979: $47,621; 2010: $47,715. How could that possibly not be relevant in an article about middle-class well-being? Because of this long-term stagnation in men’s earnings, middle-class families have had to work a lot more hours to get ahead. Of course, women’s contributions to their families’ incomes have become much more important over these years, and that too needs to be accounted for, as EPI does in State of Working America. There you’ll find evidence of 3-4 more months spent in the paid labor market by married-couple families over this period. That’s not all bad, of course, and partially reflects women’s integration into the job market as well as the decline in gender wage differentials. But you can’t ignore it, tack on taxes and health care, and wash your hands of any possible problems here. In fact, if you include these observations about wages to Ron’s thesis here, you’re left with a pretty uncomfortable conclusion: the middle class doesn’t need to worry about how they’re doing at work—we’ll make up any shortfalls with tax and health benefits. As I said, a lot of what Ron has in here makes more sense than this “disappearing middle” stuff. He’s got good evidence of the importance of increased benefits to the poor, which as we at CBPP have also stressed, have often been very effective at lifting the incomes of the bottom fifth (especially the EITC; on the other hand, as noted above, if Ron is crediting the income of the poor with the full value of provided health care coverage, he’s overcounting). But the part on the middle class is incomplete at best and misleading at worst. The man has a point. Surely some of the increased expenditures provide low- and middle-income people with better health care and more health security. But again, to blithely tack the values onto family incomes without explaining or exploring these measurement issues is misleading. Share the post "The Myth of the Myth of the Disappearing Middle Class"
3 comments in reply to "The Myth of the Myth of the Disappearing Middle Class"
Yes, Dean Baker has been making this making this point for several years now as is all but ignored, not only by the mainstream media, but by prominent mainstream economists as well. Nobody wants to talk about the “elephant in the room” of government granted monopolies and their cost to all of us. With all of the talk about debts, deficits, and inflated health care costs threatening our long term financial future, its rather amazing that Dean Baker is the ONLY person talking about this “elephant” and presenting viable alternatives; and he is completely ignored. Its quite telling that we’d rather face a Congressional showdown over a government default than to even mention this stuff in public conversations. He needs help getting the message out so we can begin to discuss alternatives to these government welfare programs. Its way past time he started getting some help with this effort! Reading a recent blog about radiation treatments for the hand, I noted that several bloggers report the cost of ten treatments at about $14,000. Advocates of reducing healthcare costs then argued the price for the same ten treatments was about $1,400 in Germany. This argument that company-paid health insurance is such a great benefit is based on pricing it five to ten times what it is worth in most other countries. It is a grand subsidy for the medical system, but hardly a wonderful “benefit” for the worker who pays 10% to 20% co-pay, which means the co-pay equals the real (global market, Mr. Ryan?) actual value, and so the insurance has no value to the worker if they were treated in another country. In short we are ripping off the corporations that are paying medical insurance, grossly subsidizing the healthcare “providers”, and misleading workers by claiming that they have traded something valuable – health insurance – in echange for the increased wages they could have otherwise demanded. The Myth of the Disappearing Middle Class is strongly supported by the reality of the missing data on government transfers to the wealthy. “A second common mistake is ignoring the contribution of government benefits to income. Our federal income tax system sends billions of dollars to poor and low-income households, substantially increasing their income and taking a bite out of inequality. Households in the top 1 percent pay about 40 percent of federal income taxes, and the top 10 percent pays nearly 75 percent. How (or more importantly, why) does any honest “numbers guy,” economist or otherwise, make a statement such as this without mentioning the enormous government transfers in the other direction and telling the truth about how its only the net amount of these transfers that is relevant to any of these questions? Haskins objects to ignoring the “the contribution of government benefits” to the income of the poor but is not troubled at all by ignoring the effects of government transfers to the wealthy? While our federal income tax system sends billions of dollars to poor and low-income households, our federal tax (including tax expenditures) and federal monopoly systems send billions (or is it trillions) of dollars in the opposite direction. The top 10 percent pays nearly 75% of taxes but what percentage of monopoly profits and tax expenditures do they receive? Is the net a cost to them or is it additional income? We seem to know a great deal about how much is transferred “from the top to the bottom” and can quickly get to the “$900 billion” number in cash and other benefits to the “poor and near-poor” but where in our government data do we go to quickly find the total amount of monopoly profits generated, who paid them, and who received them? Where is the detailed quarterly report on the distribution of tax expenditures? Is it beyond our “mathematical capabilities” to calculate these numbers or do we just like having these biases in the system because it supports the arguments of the primary beneficiaries of these government welfare distributions? Doctors and engineers swear to perform their professions by first doing no harm. It appears from pieces like this that we need to ask that economists make a similar pledge and have an oversight organization that can enforce it.